Corruptions of Empire, published by Verso in 1987 as part of the Haymarket series, collects dispatches from Alexander Cockburn written during the long Reagan era, with a focus on the mutations of American politics and journalism between Watergate and Iran-Contra. The essay below — drawn from a section of the book containing "more discursive essays with the operating assumptions of the journalism business, the psychopathology of its practitioners, and such totemic fixtures as the pundit, the foreign correspondent, and the search for 'balance'" — was initially published in Harpers in December 1980. There was a term, nicely indicative of the morbid sensitivity of most journalists, which was much in vogue on the press planes and buses of the recent campaign: "Bigfoot." One would hear it hissed in just those accents of horror familiar to fans of Biblical epics, where the sleeve of a mendicant is inadvertently turned back to reveal the diseased skin beneath: Leper! "Bigfoot" was used to describe any senior officer of the press permitted by status and function to leaven fact with advertised opinion. Whether a Joe Kraft, an Anthony Lewis, or a Hugh Sidey, the reaction provoked among the troops was analogous to that to a general visiting the trenches in the first world war. Among the smoke of press releases, the steady roar of campaign oratory, the screams of the wounded scampering toward daily deadlines, he would make a dignified tour of inspection, briefly confer with the candidate and senior officers on the spot, inscribe a few paragraphs of sagacious observation in his notebook, and return to the soft life in Washington. When finally published, the Bigfoot's observations would be read by the troops he left behind him with spite and derision. How could the Bigfoot know that the sentiments of the candidate he recorded in Pittsburgh as novel and refreshing insights had been daily staples of the stump for the previous six months, that the "stumbling and exhausted" campaigner he espied in Austin had merely been suffering from a bellyache and was as fresh as a daisy the following day? The Little Feet, campaign regulars, would thus comfort themselves in some temporary bivouac — a Howard Johnson, a Holiday Inn — before trekking forward to the next deadline. Most journalists would like to be Bigfeet all the same, enjoying the good life on the op-ed page, with a mind relatively uncluttered by facts and a notebook nicely filled with opinions. The Bigfoot, or pundit, need not be in lockstep with "the facts" but is permitted by function to move fractionally athwart the prejudices of his publishers, his readers, and of course his regular sources. The Bigfoot is permitted by sociological function not merely to report the lies of others but to contribute some lies of his own. Thus is he a senior officer in what we are pleased to call the "opinion-forming process." 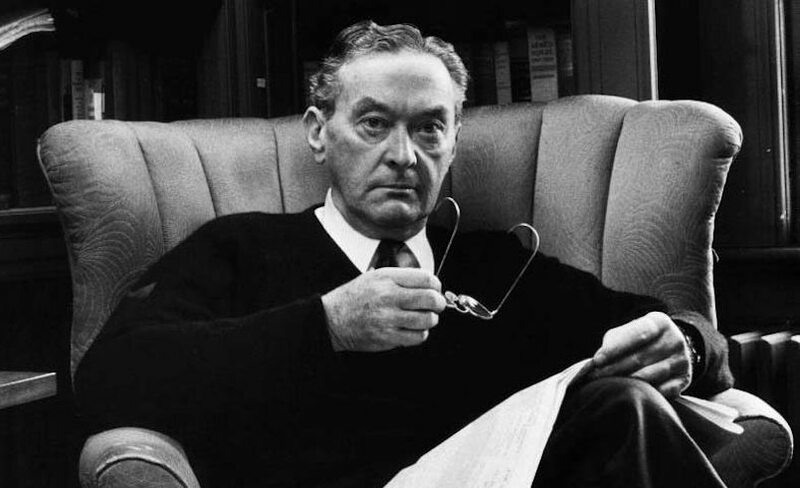 The publication of Ronald Steel's Walter Lippmann and the American Century concerns the Biggest Foot of them all: a man by the measure of whose perceptions and social utility the opinion-forming profession must stand or fall. Yet scrutiny of Steel's excellent and pitilessly faithful account of Lippmann's life and works reveals that most of the time he was wrong about everything, consistently receptive to blunder, and that on the rare occasions when he was right no one paid the slightest attention. Consider the record. In 1914 Lippmann should have seen the writing on the wall. In consort with high-minded colleagues on the New Republic he was insinuating himself into the good graces of Teddy Roosevelt, but made the mistake of criticizing one of TR's onslaughts on Wilson. Roosevelt forthwith denounced the editorial board of the New Republic as being composed of "three circumcised Jews and three anemic Christians." This should have accurately conveyed to Lippmann the constraints of access and the parameters of "constructive criticism" of the powerful. He was not deterred. In 1916 he was campaigning for Wilson, and by the following year brought untold suffering on the world by coining the phrase "Atlantic Community," a pundit standby ever since. Another lifelong cliché he shouldered at this time was his perception of the "general slouchiness and distraction of the public morale." By 1917 he was dressing up the unpalatable in terms of the exalted (traditional pundit task) and justifying U.S. intervention in the first world war by saying that it would lead to a "transvaluation of values as radical as anything in the history of intellect." He was also dodging the draft on the grounds that he wanted "to devote all my time to studying and speculating on the approaches to peace." With no trace of self-consciousness he asked Secretary of War Newton Baker for an exemption, for "the things that need to be thought out are so big that there must be no personal element mixed up with this." "He added thoughtfully that I'd rather be under a man [i.e., Baker] in whose whole view of life there is just the quality which alone can justify this high experience." Lippmann always knew how to flatter his sources and patrons, usually identical. In October of 1917, just as he was extolling the war as one certain "to make a world that is safe for democracy," he discounted the inequities of domestic censorship by saying, "I have no doctrinaire belief in free speech." Subsequently engaged in the manufacture of propaganda in Europe, he proposed to explain to German and Austrian troops "the unselfish character of the war, the generosity of our aims. ... We should aim to create the impression that here is something new and infinitely hopeful in the affairs of mankind." Only in 1930 did he bring himself to confess that the intellectual rationales he had provided Wilson to intervene might have been misguided. "We supplied," he brooded comfortably, "the Battalions of Death with too much ammunition." In 1922, in that execrable volume called Public Opinion, he produced the fully fledged pundit credo: "The common interests very largely elude public opinion entirely, and can be managed only by a specialized class." Lippmann thought that "intelligence bureaus" — staffed with pundits — would meet the need, and aid "the outsider" adequately. Simultaneously, amid fears in that year that too many Jews were going to Harvard, he was proposing that Massachusetts set up a state university "to persuade Jewish boys to scatter." In 1925 he compounded the damage wrought by Public Opinion in The Phantom Public, where he concluded it was a "false ideal" to imagine the voters to be even "inherently competent" to superintend public affairs: "Only the insider can make the decisions ... because he is so placed that he can understand and act." The Sacco and Vanzetti affair brought forth a characteristic display of mealy-mouthed fence-straddling by Lippmann, who by that time was the chief editorial writer for The World. He sedately endorsed the infamous Lowell report, which upheld the conduct of the trial, and finally — the day after the executions — praised Lowell for suffering a "disagreeable duty bravely." Measured as ever, Lippmann also doffed his hat to Frankfurter and others active in Sacco and Vanzetti's defense for their readiness to "uphold the rights of the humblest and most despised." In 1928, hot for Al Smith, he naturally discovered a "new Tammany" that would "bear comparison as to its honesty, its public spirit, and its efficiency with any other political organization which operates successfully anywhere in the country." That characteristic plunge into overstatement is, by the way, very common among pundits. But Lippmann also admired Herbert Hoover, which provokes Steel to remark another pundit trait: "Two virtually identical candidates was Lippmann's idea of a perfect election." On the verge of the crash, with a new house and sound-proofed study, and sustained by a higher salary, Lippmann was preaching "a quiet indifference to the immediate and a serene attachment to the processes of inquiry and understanding." Democracy, he opined, "cannot last long; it must, and inevitably it will, give way to a more settled social order." In 1931, at a dinner organized for him by Thomas Lamont of the House of Morgan, he discoursed on "Journalism and the Liberal Spirit": "Who but a political hack can believe today," he told the assembled businessmen, lawyers, and jurists, "that the fate of the nation hangs upon the victory of either political party? ... Who can believe ... that the cure for the corruption of popular government [is] to multiply the number of elections? Who can believe that an orderly, secure and just economic order can be attained by the simple process of arousing the people against the corporations?" A luxurious cruise to Greece, courtesy of Lamont, followed two days later. In 1932 he displayed his usual acuity by attacking FDR as too cautious to take political risks, but came round to him rapidly, sustained by the counsel of one of his banker friends, who wrote to him that "the hungry and the unemployed might be hard to handle this winter if we were in for four more years of the same policies and the same President." Before receiving this prudent advice, Lippmann had opposed the child-labor amendment, a federal guarantee of civil rights, and the early payment of veterans' bonuses. When a proposal came up to provide pensions for the widows and orphans of veterans, he said that such special-interest groups posed "a menace not only to the budget but to popular government itself." Nor was Lippmann's attention restricted to domestic unrest. In 1933, just after books were burned in the streets of Berlin, he solemnly wrote that repression of the Jews, "by satisfying the lust of the Nazis who feel they must conquer somebody and the cupidity of those Nazis who want jobs, is a kind of lightning rod which protects Europe." A week later he was praising Hitler for "a genuinely statesmanlike address" that expressed the authentic voice of a genuinely civilised people. The word "statesmanlike" is the traditional mark of the Bigfoot. No higher term of praise exists in his vocabulary, for it is the attribute of the ultimate insider-executive, who is beyond mere politics or the sufferings of the Jews or other groups of humans, and who works purely for the higher good. In 1936 he was busy praising the British and the French for remaining neutral in the Spanish Civil War, since neither the legally elected Loyalists nor the Fascists were "able or fit (pundit word] to organize government." As the Spanish Republic was forced to turn to the Soviet Union for arms he duly noted that it had "steadily degenerated into a proletarian dictatorship under foreign guidance." Chided later for this view he confessed that "My mind works like a spotlight on things, and it wasn't one of the things I was interested in at that time." So much for the Spanish Republic. In 1937 he was at it again, coming away from Europe "with the feeling that ... the Western democracies were amazingly complacent, distracted, easy-going and wishful." A year later, concerned with "distracted" Europe's overpopulation problem, he suggested that a million "surplus" Jews be sent to Africa. You may have guessed that Lippmann went for Wilkie in 1940. In 1942, when hysteria about Japanese-Americans on the West Coast was reaching fever pitch, Lippmann concluded after a visit that the whole Pacific Coast was in "imminent danger" of attack "from within and from without" and that the enemy could inflict "irreparable damage" through an attack supported by "organized sabotage." His column naturally compounded the panic and helped prompt the relocation of Japanese-Americans into concentration camps forthwith. Later, Lippmann, having partly caused the panic, tried to excuse the relocations on the grounds that they were necessary to protect the victims from the mob. Though he popularized the phrases "national security" and "Cold War," Lippmann was relatively restrained and sensible in the postwar and McCarthy years. Being athwart official consensus he consequently had no effect. The pundit can never inflect government policy, only explain or excuse it. In his more excitable moments, however, he called, in 1946, for a "new mighty upsurge of new national economy" to confront Russian aggression; urged the nation to be put on a war footing in the wake of the Prague coup of 1948; approved the dispatch of the Seventh Fleet to the Strait of Formosa in 1950; and concluded in 1952 that it would be a "catastrophe of enormous proportions ... if Southeast Asia were to fall into the communist orbit." He approved the Anglo-French attack on Egypt in 1956 with a classic piece of on-the-one-hand-ism — "we may wish that they had not started," but "we cannot now wish that they should fail." Love affairs with Kennedy and the early LBJ prompted a defense of the first bombing of North Vietnam as a "test of American will." In 1965 he considered retaliatory airstrikes to be wise ventures, since they would put the US in "a better bargaining position for a negotiation." Knowledgeable of the corridors of power, he told Eric Sevareid and a CBS audience in that year that war hawks are "not found in the interior and at the top of the White House." In the same year, too, he endorsed the U.S.-backed coup in the Dominican Republic. Then, somewhat late, he discovered that LBJ was a hawk, and that the war in Vietnam was a bad idea. Of the president he said sadly, in the distressed tones of the betrayed pundit, "He misled me." He went into opposition and, ultimately, exile in New York. Disillusion did not lead to wisdom. In 1968 he reported that there was a "new Nixon, a maturer and mellower man." The emotions of contempt and mirth natural upon review of this catalogue of misjudgment should of course be tempered by pity. Any journalist who has swung himself into the saddle of punditry and bigfooted it across country will know the temptations of the trade. It's bad luck on Lippmann that Steel had the energy to excavate the punditry of over half a century and lay out the results for all to see. Opinion columns were designed by God to have the same lifespan as a croissant. The problem is that we do not have — as the Russians do — a press that is self-evidently and admittedly controlled by the state. When the Russian leadership wants to write an op-ed about Zbigniew Brzezinski ("lacks statesmanship") the Central Committee gets around a table, chews a few pencils, and then puts the result in Pravda under a collective pseudonym. The column is then carefully studied by Pravda readers around the world as evidence of what "the Kremlin" thinks about Zbig. The poor Russians have never quite fathomed the complexities of opinion production this side of the Atlantic (though one Soviet commentator did once tell me he thought the Freemasons were behind it all). They viewed Lippmann as someone roughly equivalent to a minister of information and made a great fuss over him when he came to town. They were generally correct in their estimate of him as a bipartisan functionary of the U.S. government, and were consequently bewildered when the U.S. embassy would call up once in a while and tell them that the old sage was speaking for no one but himself, and that — to take one example — his tolerant view of their "sphere of influence" in Eastern Europe was not shared by John Foster Dulles. Lippmann was a special case in that he did not graduate to punditry after long years on the police beat, but parachuted into the editorial suite at a young age. He was born with Big Feet anyway, and probably emerged from the womb dictating a measured column on the first Japanese constitution, which was being promulgated around the time he entered the world. Punditry performs a couple of practical functions for newspapers. On the old principle that comment is free and facts are expensive, it takes care of a couple of pages on the cheap and gives the publisher a proper sense of his own importance to boot. It also provides a stepping stone for those on the way from the newsroom to retirement: a stint as Sage in Residence and then the ink-stained old nag can be quietly let out to pasture. Clearly there has to be some form of government regulation to cope with the alarming pundit surplus. One answer might be to have a Pundit Supreme Court, with the nine pundits — nominated by the president and confirmed by the Senate — handing down opinions and dissents after all due consideration and consulting of precedent. Their conclusions would then be available to the news media for a modest fee. No other opinion columns would be allowed. In the case of consistent misjudgment — here Lippmann springs to mind — recourse to impeachment would be available. The only other solution would be to have some sort of primary system and election of pundits, so that every four years they could be answerable to the American electorate. Lippmann would not have liked that, and I doubt whether many of his successors would either. If there is one thing that causes a pundit unease, it's the instincts of the herd in war or peace.